The 20-block masterplan covers the former Penn Central railroad property in South Boston, most of which has long been used for parking. 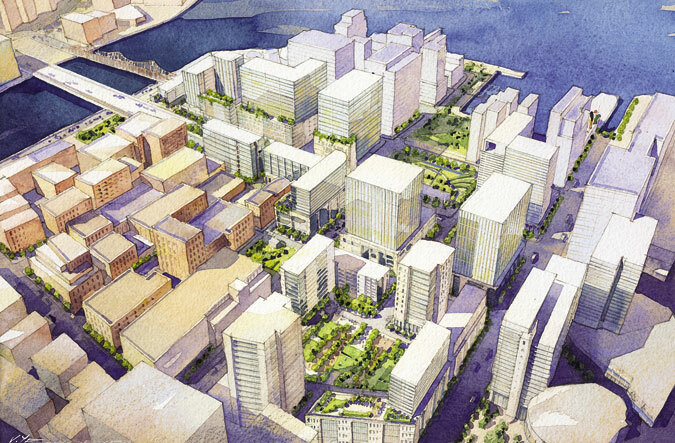 Late last month, the Boston Redevelopment Authority (BRA) gave the preliminary go-ahead for Seaport Square, a 23-acre, $3 billion mixed-use development in the South Boston waterfront district. Officials describe the 6.3 million-square-foot scheme as the largest single project in the city’s history. The BRA approved Kohn Pedersen Fox’s masterplan for a 20-block, 22-building residential neighborhood with a mix of retail, office, hotel, civic, and cultural spaces and significant open space—almost 40 percent of the project—including several parks and linear green space. 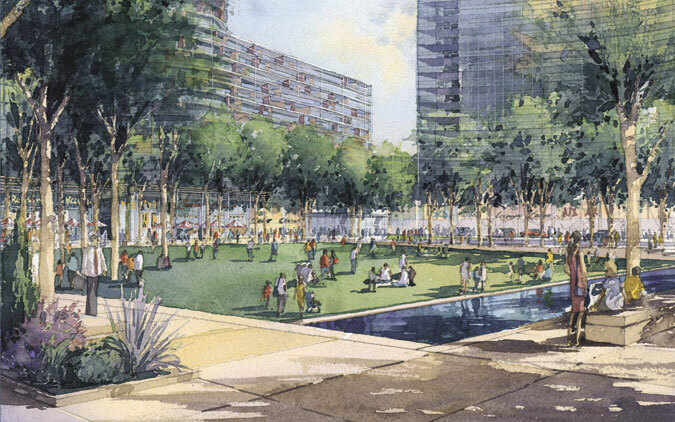 The pedestrian-oriented plan also includes connections to the waterfront and the downtown business district, with much of the development’s parking hidden below ground. The former Penn Central railroad property, most of which has been used for parking since the 1970s, sits between the Boston Convention Center on Summer St. and Fan Pier, where Diller Scofidio + Renfro’s Institute of Contemporary Art opened in 2006. Seaport Square’s landscape will ultimately slope from the 25-foot deck of Summer St. to water level. the mixed-used plan aims for a lively downtown feel, with pedestrian connections within the neighborhood and to central boston. According to KPF principal and chief designer Jamie von Klemperer, the design draws on themes explored in the firm’s masterplan for the massive city of New Songdo, rising near Seoul, South Korea. While the scale and context are worlds apart, the experience has honed the firm’s skills at combining the elements of a mature urban environment with a clean slate. “It’s this idea of creating a synergy of somewhat overlapping functions in a very tight space,” von Klemperer said. Fifth-term mayor Thomas Menino has designated the waterfront district an “innovation district,” and city officials are hoping to lure existing companies and startups in the high-tech, life sciences, and creative sectors to the area. To that end, the developers, Boston Global Investors, Morgan Stanley, and W/S Development Associates, recently added a high-tech business incubator and workforce housing to the project. Proponents of the plan note that it adds much-needed affordable and moderately priced housing. “Decreasing the size of some of the housing units creates a denser and more livable pattern, and results in more affordable housing,” said Tom Piper, a research scientist in the MIT Department of Urban Studies and Planning. “That means more people, which makes the streets more active.” Unfortunately, he added, the developers have to live with a tangle of highway on-ramps and access roads for the Central Artery, which skirts the site and runs through it in some places, creating a challenge for pedestrian links within the neighborhood and walkable connections to other parts of the city. Over its five-year evolution, the project has shifted from an early emphasis on office space to residential, according to von Klemperer. The approved plan calls for 2.8 million square feet of residential space (70 percent market-rate), 1.15 million square feet of office and life sciences space, 1.25 million square feet of retail, 250,000 square feet of civic and cultural space, and 860,000 square feet of hotel space. almost 40 percent of the project is open space, with a variety of parks and linear green areas. The first phase, scheduled to get underway in late 2011, will include several apartment buildings and the Innovation Center incubator. As of early October, architects for those projects had not been selected. While each building will be designed to LEED standards, the project as a whole will incorporate energy efficiency through co-generation plants and shared systems. The developers have shown a willingness to accommodate neighborhood and city concerns, whether changing the orientation of buildings to avoid the canyon effect, reducing building heights, or providing playing fields, according to Vivien Li, executive director of the nonprofit Boston Harbor Association. While the plan’s approval is encouraging, city officials are wary of getting left with acres of vacant sites should the development stall out. Indeed, Boston Global Investors CEO John Hynes III played a lead role in a condo and office tower on the site of the former Filene’s department store in nearby Downtown Crossing—a project that notoriously stalled after demolition and excavation in 2008. According to BRA director John Palmieri, the authority has since made final approval of developments contingent on a confidential review of project financing.